A taxi from Seville at the airport taxi stand. Taxi service to the Seville airport is provided by several official taxi companies and disposes of single taxi rank at the passenger terminal, both for drop off passengers and pick up passengers. Taxis operating at the airport are white with a yellow stripe on the back doors. 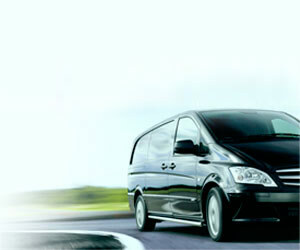 There is a flat rate for the journeys from the airport to the city, or vice versa ("Tarifa Única Aeropuerto"). This rate is applied by all the taxi companies and does not have extra charges for supplements, such as the number of packages or suitcases, initial service, departures from Santa Justa train station in Seville, or others special charges such as weekend or night service, except if the service is requested by telephone. In this case, the taximeter will be charged until the passenger pick-up point. This airport flat rate is valid for the Seville Airport - Seville city journey, within the limits of the ordinary fare, and vice versa. The taxi journey from Seville Airport to the city center takes approximately 15 minutes, depending on traffic. For other destinations the urban and interurban rates, detailed below, will apply. 1. 1 €22,20 Urban services from Monday to Friday, from 7am. to 9pm. 1. 2 €24,75 Urban services from Monday to Friday, from 9pm. to 7pm. on Saturdays, Sundays and holidays, and on December 24th and 31st, from 0am. to 12pm; and the days of Holy Week and the April Fair (Feria de Abril), from 7a.m. to 9pm. 1. 3 €30,93 Urban services during Holy Week and the April Fair (Feria de Abril), from 9am. to 7pm. Requesting the taxi service by phone, the amount of the meter will be added to the amount up to the meeting point with the passenger. Taxi service to Puerto del Batán, Sevilla Tickets, Palmas Altas, Shipyards and Esclusa: €2,18. Taxi service to airport flight control and CASA San Pablo: €4,80. * For each suitcase or package or set of packages of more than 10 kg: €0,49. * Departure from Santa Justa station: €1,41. * Friday, Saturday and holiday eves from 10pm to 6am: €2,10. Guide dog has no supplement. * Interurban service 1: from Monday to Friday, from 6am. to 10pm. ** Interurban service 2: from Monday to Friday, from 10pm. to 6am., and on Saturdays, Sundays and holidays.